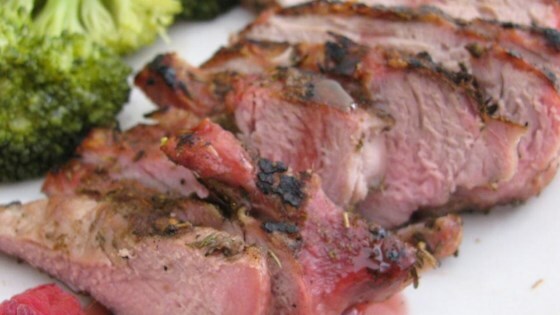 "Succulent herbed boneless pork loin chops paired with a tangy raspberry sauce ... heaven on a plate! This is a special family dish or perfect for company. I accompanied it with mashed potatoes and julienned steamed carrots. My husband can't wait to have it again." You may substitute 1 teaspoon minced fresh herbs for 1/2 teaspoon dried herbs. The pork chops in this sauce is amazing. I doubled the sauce, and added 2 Tbsp of butter at the end. I served it with french green beans and roasted red skin potatoes.